Serbia (Serbian: Србија, Srbija)  is a country located in the Balkans, in southeast Europe. It was a founder and one of the six republics of the former Socialist Federal Republic of Yugoslavia. It is surrounded by Montenegro and Republic of Kosovo to the southwest, Bosnia and Herzegovina to the west, Bulgaria to the southeast, Croatia to the northwest, Hungary to the north, North Macedonia and Albania to the south, and Romania to the northeast. It is situated on one of the major land routes from Central Europe to Turkey and further on to the Near East. During the summer tourists love spending their time in Belgrade and enjoy the nature of many national parks throughout the country. In winter, they are warmly welcomed to mountain resorts (one of the most popular being Kopaonik, featured on BBC as one of the best ski destinations in Europe). There are also many spa resorts such as Sokobanja, Niška Banja and Vrnjačka Banja. Serbs are warm people, especially towards foreigners. They are very welcoming towards tourists, of which there are not many as the country's full potential has yet to be reached. Most Serbs speak some English and/or Spanish and are eager to practice it (seniors, however, are more likely to speak German and/or French), so you will be able to find your way around by asking directions. Most tourists come to Serbia in the summer and you can often hear German, Italian, French and English in the streets of Belgrade, while Slovenian, German, Austrian, Bosnian, and Hungarian tourists pour for New Year holidays. Yugoslavia was such a beautiful country with so many different attractive places that somehow, Serbia was neglected and it is still to be rediscovered not only by visitors, but by many Serbs, too. It is also a varied and beautiful place notwithstanding the fact that it is landlocked. From the plains of Vojvodina, which in winter, remind of the scenes from the film of Dr. Zhivago, to many mountains and lakes or reservoirs and ski resorts of outstanding beauty. There were seventeen Roman emperors born in the territory of today's Serbia, and it is well-known that they all left monuments and built palaces in or close to their birthplaces. It may well be that the oldest ever found human settlements in Europe, if not in the world, can be found in country of Serbia. The giant hydroelectric dam of Djerdap has created a lake stretching for many miles out of the Canyon Djerdap with its famous Roman road to the East build by the Emperor Trajan. Serbia is on the crossroads of European history and as such, it is a mix of cultures, ethnicity and religions. Its people, contrary to a recent stigma, are one of the most hospitable and welcoming and recently, Belgrade was voted as one of the up and coming capitals of Europe. It hosted the recent Eurovison song contest and it is the home town of world names like Djokovic, Jankovic and Ivanovic; the ambassadors of New Serbia. There may be more attractive locations elsewhere, but Serbia has a spirit and a soul that is rare to find coupled with melange of different cultures and a gusto for good living. In the north: continental climate (cold winters and hot, humid summers with well distributed rainfall); central portion: moderate continental climate; and to the south: hot, dry summers and autumns and relatively cold winters with heavy snowfall. Temperatures can be quite extreme, in summer temperatures of over 30ºC are quite frequent, and sometimes can even approach 40ºC, especially during July and August, in most of the territory. During winter, heavy snowfall is common in the whole country but especially in the south and west of the country. In Belgrade and Novi Sad temperatures of -10ºC can be common during January and February, and sometimes can go as low as -18ºC. In mountain places such as Zlatibor, Kopaonik or Sjenica temperatures can be much lower and snowfall can begin at a much earlier time of the year as in the rest of the country. Serbia features an extremely varied geography, and the whole territory is crossed by some of the main rivers in the Southeast of Europe, especially the Danube, which extends from the North-West (border with Croatia) to the East of the country (border with Romania and Bulgaria), on its way passing along important cities, spectacular landscapes and attractions, such as Novi Sad, Belgrade, Smederevo and the Đerdap National Park. There is a cycling route along the Danube's whole course in Serbia and lots of tourist material to help you get along. Other important rivers are the Drina (going south to north mainly along the border with Bosnia and Herzegovina, as well forming spectacular landscapes), the Sava (running from the Croatian/Bosnian border until Belgrade, at which centre it meets the Danube), the Morava (goes from the extreme south and west of the country, crossing it completely until it meets the Danube near Požarevac), and the Tisa (born in Ukraine and coming from Hungary, crossing towns such as Bečej and Novi Bečej, and meeting the Danube in a point between Belgrade and Novi Sad). The northern region of Vojvodina is composed of extensive fertile plains used for agriculture, and few mountains around (the only ones being the Fruška Gora National Park, and some hills around the city of Vršac). The area around Belgrade and the south of it, called Šumadija, is composed of hilly terrain and small mountains, while the South, East and West of the country are mountainous, in which mountain roads, natural caves and river gorges are impressive and found almost everywhere. Although the region around the town of Mionica has been known for some earthquakes in recent years, these were by no means destructive. The highest point is Đeravica at 2656 m.
A traveler with average knowledge of this region can find history of Serbia to be surprisingly rich. Few interesting examples first: on Serbia's modern-day territory most of the Roman emperors were born after Italy (about one in five). One of them was Constantine, the first emperor who legalized Christianity. One of the oldest Neolithic cultures, arguably the richest one, started here (Vinca). Recently, the start of the Bronze age was changed to 500 years earlier due to the first evidence of copper smelting (Plocnik). The Skull Tower is not a fictional place and it can be found there. The most decorated female warrior in the history of warfare was Serbian. The first Serbian state was formed in the mid 9th century, expanding by the mid 14th century to an empire comprising most of the Balkans. In 1389, the Serbs lost a decisive battle in the Kosovo field against the Ottoman empire. Serbia managed to preserve its freedom for another seventy years, only to be finally overwhelmed by the Turks in 1459. An uprising in the early 1800s that grew in the full scale war (War of Restoration) led to the restoration of Serbian independence in 1815. The 1914 Austro-Hungarian invasion of Serbia following the assassination of Archduke Ferdinand by an ethnic Serb high school student precipitated the first World War. In its aftermath in 1918, victorious Serbia gathered all south Slav lands (Croatia, Slovenia, Slavonia, Dalmatia, Bosnia and Herzegowina, and Montenegro)into the Kingdom of Serbs, Croats, and Slovenes; The country's name was changed to Yugoslavia in 1929. Invasion and occupation by Germany and Italy in 1941 was resisted by Yugoslav Army in fatherland (Chetniks), commanded by Lt.-Gen Dragoljub Mihajlović and communist led guerilla (partisans) who eventually started fighting each other as well as the invaders. The partisans, commanded by the Croatian-Slovenian Field-Marshal Josip Broz aka Tito emerged victorious and formed a provisional government that abolished the monarchy and proclaimed a republic in 1946 after a dubious referendum. At the end of the war, nearly all ethnic Germans left the country. Although pro-Communist, J.B. Tito's new government successfully steered its own delicate path between the Warsaw Pact nations and the West for the next three and a half decades, until his death in 1980. 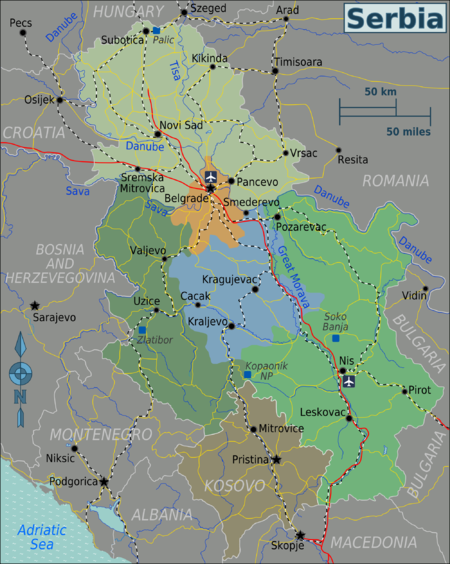 In the early 1990s, post-Tito Yugoslavia began to unravel along ethnic lines: Slovenia, Croatia, and the Former Yugoslav Republic of Macedonia all split from the Yugoslav Union in 1991; and Bosnia and Herzegovina in 1992. All of efforts to preserve Yugoslavia were ultimately unsuccessful and bloody civil wars broke out in Croatia and in Bosnia. The remaining republics of Serbia and Montenegro declared a new "Federal Republic of Yugoslavia" (FRY) in 1992. Slobodan Milosevic was elected the first president of Serbia. In the late 1990s, the conflict with the Albanian separatist movement in Kosovo led to a NATO bombing campaign and direct intervention, which left the placement of Kosovo under a UN administration. Slobodan Milosevic, by this time elected for the president of the federation, lost in the Federal elections in the fall of 2000 to Vojislav Kostunica, and later was judged for war crimes alongside many others. The country reestablished its membership in the UN and started preparations to join the EU. In 2002, the republics of Serbia and Montenegro began negotiations to forge a looser relationship, which led first to the name change of the nation to "Serbia and Montenegro", then culminated in Montenegro declaring independence in June 2006. More recently, Kosovo unilaterally declared its independence; however, this act remains unrecognised by Serbia and some other countries. Independence came on 4 February 2003 (when it changed from the Federal Republic of Yugoslavia to the State Union of Serbia and Montenegro) or on 5 June 2006 (from the State Union of Serbia and Montenegro to Serbia). The celebration of holidays tends to be a very important aspect in the Serbian culture, and as such, almost all businesses will be closed during the national ones (especially religious ones). New Year (Nova Godina) - January 1. No-working day. Badnji Dan - January 6. The celebration of Christmas Eve, in most churches people with gather at midnight with dry branches of a tree (Badnjak) to burn them for Christmas day. Most businesses have shorter work times. Christmas Day (Božić) - January 7. Orthodox Christmas Day, no-working day. Old New year (Stara/Srpska Nova Godina) - January 14. New Year according to the Orthodox calendar. Normal working day. Serbian National Day (Sretenje - Dan Državnosti) - February 15. No-working day. Easter (Uskrs) - Normally the first or second week of April. Orthodox Easter, same as in Catholic easter, is holiday period. Labour Day (Dan Rada) - May 1. No-working day. Victory Day (Dan Pobede) - May 9. Normal working day. Day of Remembering the Serbian Victims during II WW (Dan Sećanja na Srpske žrtve u Drugom Svetskom Ratu) - October 21. Normal working day. Day of the End of the I WW (Dan Primirja u Prvom Svetskom Ratu) - November 11. No-working day. New Year's Eve - December 31. Working day but with reduced hours. Major retail establishments such as supermarkets and shopping malls remain open on all of these days except January 1 and January 7. There are also several officially designated days on which only the members of certain religious minorities have the right not to work. In practice this means that in the northernmost areas of the country, including Subotica, where there is a sizeable Catholic population, many shops close on December 25 - Christmas Day according to the Gregorian calendar. Serbia's official currency is the Serbian dinar (RSD). The Serbian dinar can be exchanged in most of the banks throughout Europe. You can convert your currency into RSD at the airport, nearly all banks, or in the numerous and visibly marked authorized exchange offices (Menjačnica/Мењачница). Official exchange offices show the seal of the National bank of Serbia but have worse rates than the numerous smaller unofficial exchange offices. The Euro is occasionally accepted, but prices are often overestimated when directly compared to the Dinar. Belgrade is typically on par with many European cities prices; however, outside the capital, prices of almost any item are lot lower than in the capital. Typically, 150 dinars for a coke in a Belgrade bar, and 220 dinars for 3 cokes in a bar outside the capital. Supermarket prices stay constant, throughout Belgrade with Coke at approx 120 dinars for 2 liters and a loaf of white bread at 40-60 dinars at Feb 2014. In June 2017, the dinar exchange rate stood at 110 Serbian Dinars for 1 US Dollar, 123 Serbian Dinars for €1 and 157 Serbian Dinars to 1 GBP. Money changers may refuse worn-out or damaged foreign banknotes, especially US dollars, therefore it is recommended to bring notes only in good condition. Banks usually accept slightly damaged notes, sometimes with a commission. Gas stations close to borders sometimes accept foreign currencies. Serbia uses the Metric system. The administrative limits of the city of Belgrade, including the city itself and the surrounding outskirts and towns. The East and wild South of Serbia, highly mountainous terrain, especially in the extreme south of the country, full of natural beauty along the Danube, especially in the national park of Djerdap and the areas bordering Kosovo and Bulgaria. Dotted with archaeological sites, from the pre-historical ruins in Lepenski Vir, the Roman ruins in Felix Romuliana in Zaječar and Viminacijum near Požarevac to the Ottoman ruins and fortresses in Niš, Pirot, Ram and Kruševac. The western region of Serbia, getting its name from the Drina river, this area includes most of the natural wonders in Serbia, such as the national parks of Tara National Park, Zlatibor and Kopaonik. Ski resorts and facilities for rafting and other extreme sports are ubiquitous. The area is home to the UNESCO World Heritage Sites of Sopoćani and Studenica. The centre of Serbia and the most traditional part of the country. It is full of smaller hills and some forests. The industrial city of Kragujevac is located here, as well as some interesting destinations such as Smederevo with its impressive fortress, Topola full of ancient monasteries, and the ancient Serbian capital of Kraljevo. Region composed almost entirely of endless agricultural plains, home to the second largest city and an attraction on itself, Novi Sad, as well as other interesting towns such as Subotica, Vršac, Pančevo, Sombor, Kikinda and Zrenjanin. Naturally, Fruška Gora and Deliblatska Peščara are well known features, as well as the rivers such as the Danube and Tisa, and lakes such as Palić and Bela Crkva. Belgrade and Vojvodina are relatively economically prosperous and have a Central European influenced culture, while the southern regions are less prosperous and have a more traditional Serbian feel. Considered an autonomous province of Serbia by the United Nations, Kosovo has been recognized by many Western nations and is de facto an independent republic. It has an ethnic Albanian majority; however, the Northern, Serb majority part of Kosovo remains connected to Serbia. We cover Kosovo in a separate article. While the legitimacy of the Kosovan government is disputed by many countries, from a traveller's point of view the Kosovar government has de facto control of the area (separate laws, including regarding entry requirements; though in North Kosovo, the local currency, flag and currency are Serbian). This is not a political endorsement of claims by either side in the dispute. Belgrade (Beograd/Београд) — the capital of Serbia. Novi Sad (Serbian Cyrillic: Нови Сад) — Provincial Capital of the Autonomous Province of Vojvodina and second largest city (after Belgrade). Novi Sad is located about 80 km north of Belgrade, on the Danube river. The city is an important industrial, cultural, educational, medical, sports and tourist center with many cultural and historical monuments and museums. The city is best known for its impressive fortress and numerous baroque churches. South of Novi Sad, on the old road to Belgrade, there is a small historical town of Sremski Karlovci, nowadays most famous for its wine cellars. Fruška gora National Park, adorned with 16 Orthodox monasteries, is also located near the city. Niš (Serbian Cyrillic: Ниш) — The third largest city in Serbia. Niš is a great car and railway junction in the south of Serbia and the Balkans, with well developed industry, rich history, and numerous cultural-historical monuments. Niš is the birthplace of Constantine the Great, Roman emperor who decreed tolerance for Christians in the Roman Empire, and the city was the venue for the millennial celebrations of the proclamation of Edict of Milan in 2013. Famous Niš Spa (Нишка Бања) is located in the vicinity of the city. Kragujevac (Serbian Cyrillic: Крагујевац) — The first capital of modern Serbia, industrial hub and the 4th largest city in Serbia. Kragujevac is located in the region Šumadija, 120 km south of Belgrade. Small river Lepenica passes through the city. Beautiful Gruža Lake (Gružansko jezero/Гружанско Језеро). The city has a university, and is an important cultural centre of Šumadija. It has a rich history and many cultural and historical monuments. Novi Pazar (Serbian Cyrillic: Нови Пазар) — Multicultural and multi-ethnic city in Southwestern Serbia, with oriental vibrations. Home to many priceless monuments from different historical periods, and a gateway to UNESCO site of Stari Ras - ancient complex of the first Serbian state, where is the oldest church in Serbia. The city has plenty of medieval monuments left from the Ottoman Empire. Kruševac (Serbian Cyrillic: Крушевац) — Kruševac was founded in 1371, as a fortified town in the possession of Lord Lazar Hrebeljanović, at the time it was the capital of medieval Serbia for less then a century. Kruševac is located in the region of Central Serbia, 180 km south of Belgrade. Small river Rasina passes through the city. Kruševac has an incredibly rich history and many cultural and historical monuments including Slobodište, Don-žon kula, Lazarica church and monument to the Kosovo heroes. Kraljevo (Serbian Cyrillic: Краљево) — Kraljevo is an important economic centre in Serbia, located 170 km south of Belgrade. It lies on two rivers, Morava and Ibar. Famous monastery of Žiča (Жича), main church for coronations of medieval rulers of Serbia, is located in the outskirts of the city. In addition, there are two beautiful spas in the vicinity, Mataruška Spa (Матарушка бања) and Bogutovačka Spa (Богутовачка бања). The city was heavily damaged in an earthquake in 2010. Subotica (Serbian Cyrillic: Суботица) — has been rated as one of the most beautiful cities of Serbia. It is in North Serbia, and is the closest city to Palic.An important commercial and cultural center with a rich history. The main languages are Serbian and Hungarian.In the vicinity of Subotica is a famous resort and lake Palic, and Ludoško lake. Čačak (Serbian Cyrillic: Чачак) - Čačak is a city in central Serbia. It is the administrative centre of the Moravica District, and the main industrial, cultural and sports centre of the district. In the outskirts of the city, there are two well-known spas: Gornja Trepča Spa (Бања Горња Трепча) and Ovčar Spa (Овчар Бања). Ovčar-Kablar Gorge, with its beautiful old monasteries, is located nearby. Famous Guča Trumpet Festival takes place in Guča village, some 20 km from Čačak; during the festival days, this village gets more than half a million visitors every year. Užice (Serbian Cyrillic: Ужице)-is a town in western Serbia in the Zlatibor district, 200 km southwest of Belgrade. City lies between the hills on the river Đetinja. It is an important transportation, economic, cultural, sports center, with a rich history. Near the town (Uzice) of the famous tourist destinations Zlatibor, Tara National Park, Mokra Gora (Drvengrad) narrow gauge railway "Sargan Eight" and so on. Šabac (Serbian Cyrillic: Шабац), a beautiful city in the Mačva District in Western Serbia, located on the Sava river. Požarevac (Serbian Cyrillic: Пожаревац) — One of the oldest cities in Serbia with a large historic heritage.An important commercial and cultural center, in addition to the Velika Morava river, is situated about 80 km east of Belgrade. Near the town is a small town of Stari Kostolac where is the famous archaeological site Viminacium.In Pozarevac was born former president of the Republic of Serbia - Slobodan Milosevic (he was also buried there).Pozarevac is also known for Ljubicevo Equestrian Games. Sremska Mitrovica (Serbian Cyrillic: Сремска Митровица) - one of the oldest cities in Serbia and in Europe. It was once known as Sirmium in the Roman Empire, and was one of the four capitals during the tetrarchy period. Vranje (Serbian Cyrillic: Врање) -is located in southeast Serbia closer to the FYRM (Skopje), at 340 km from Belgrade and 100 km from Nis, in the South Morava River valley.It is an important commercial and cultural center, with a rich history. Nearby is known Vranjska spa, and mountain Besna Kobila. Vršac (Serbian Cyrillic: Вршац) — One of the most beautiful cities in Serbia.Located at 80 km northeast of Belgrade, near Romania. Vrsac has developed economic and cultural and sports center, rich in vineyards. Soko Banja (Serbian Cyrillic:Соко Бања) — the road to Sokobanja detaches on 200-th kilometer of the motorway Belgrade - Athens. Sokobanja is situated in basin between the mountains Rtanj (1,560m) and Ozren (1,117m), 400m above the sea level. Sokobanja is a famous spa and tourist place in Serbia for its moderate continental climate and immense surfaces of woods, fresh air and a lot of thermo-mineral sources. They all make Sokobanja an exceptional place in Serbia. Oplenac (Serbian Cyrillic: Опленац), (town of Topola) south, near Belgrade. There is a Mausoleum of the Serbian Royal family Karadjordjevic (St. George's Church),museums. You can also enjoy the famous royal Oplenac the vineyard. Surrounding the town of Topola is a famous wine growing region with excellent wine. Guča (Serbian Cyrillic:Гуча)— a village in the Dragačevo district (about 20 km from Čačak), where a famous brass music festival (Трубачки фестивал) is held annually. Kopaonik National Park (Serbian Cyrillic:Копаоник Н. П.) — as well as the ski-resort in the Kopaonik Mountain in southern Serbia.Kopaonik is the major ski resort of Serbia, with total of 23 ski lifts. A national park spread over 118.1 km2 (45.6 sq mi).Kopaonik has a rich historical heritage.Sports and recreation are key factors to the tourism of Kopaonik. There are various other activities as well. Other features which attract tourists are a luxurious hotel, and entertainment. Kopaonik has many cafes, bars and night clubs etc. Palić (Serbian Cyrillic:Палић) — the lovely lake area in the north with baroque parks, the monuments of art nouveau architecture and a long tradition in catering made it fashionable summer resort. Palić is the host of a film festival, World Ethno Music Festival, and various sporting events. Zlatibor (Serbian Cyrillic:Златибор)— a very famous mountainous tourist site and ski-resort in the southwest.Zlatibor is located near the town of Uzice, en route to Montenegro.Zlatibor is situated at an altitude of 1000 m., summers are sunny, fresh air, cold winters, beautiful landscapes, meadows, pastures, valleys, ethnic villages, sports facilities, etc.There you have special medical and famous Rehabilitation Institute. Tara (Serbian Cyrillic: Тара), is a mountain located in western Serbia (near Zlatibor mountain). It is part of Dinaric Alps and stands at 1,000-1,500 meters above sea level. The mountain's slopes are clad in dense forests with numerous high-altitude clearings and meadows, steep cliffs, deep ravines carved by the nearby Drina River and many karst, or limestone caves. The mountain is a popular tourist center. Most of the mountain is a national park (Tara National Park). Mountain Tara has a nice Zaovine Lake, at an altitude of 800 m.
Vrnjačka Banja (Serbian: Врњачка Бања) - Vrnjačka Spa is the largest and most famous spa resort in Serbia and traditionally very attractive tourist resort for rest and recreation. The spa is located in central Serbia, 200 km south of Belgrade, near city of Kraljevo(Trstenik). Vlasina (Serbian Cyrillic:Власина) air spa and lake - located about 350 km. southeast of Belgrade,after Leskovac, near Surdulica. Vlasina is located at an altitude of 1200 m. and the surface of the lake is 16 square kilometers. Vlasina the landscape of outstanding features. Like neighbouring Bosnia, Macedonia, Montenegro and (for non-EU/EFTA citizens) Croatia, foreigners are required by law to register themselves with the police station in their district within 24 h of receiving a Serbian entry stamp at a border crossing or airport. You should receive the bottom part of the Foreigner Registration Form to carry with you if registering at a police station, or a printout from hotel reception if staying at a hotel; when exiting the country, you may be required to present it to the Border Police. However, at least at land (especially train) borders, it is extremely rare for border guards to even scan passports/ID cards or ask a single question, let alone ask for registration slips, so usually you can keep it as an administrative memento. In theory, though, failure to register could result in prosecution and a large fine. Nationals of all European Union countries (including all classes of British nationality), plus Albania, Andorra, Argentina, Australia, Azerbaijan, Bahrain, Bolivia, Bosnia and Herzegovina, Brazil, Canada, Chile, Costa Rica, Cuba, the Holy See, Iceland, Israel, Japan, Kuwait, Liechtenstein, Macau, Macedonia, Mexico, Moldova, Monaco, Mongolia, Montenegro, New Zealand, Norway, Oman, Peru, Qatar, San Marino, Seychelles, Singapore, South Korea, Switzerland, Tunisia, Turkey, United Arab Emirates, United States and Uruguay may enter Serbia visa-free for up to 90 days within a six-month period. Those from the European Union, Bosnia, Macedonia, Montenegro and Switzerland may enter using a national ID card in lieu of a passport. Nationals of Belarus, China (PRC), Georgia, Kazakhstan and Russia may enter Serbia visa-free for up to 30 days. Nationals of Ukraine may enter Serbia visa-free for up to 30 days within a 60-day period. Nationals of the Bahamas, Barbados, Burundi, Colombia, Guinea-Bissau, India, Indonesia, Jamaica, Paraguay and Saint Vincent and the Grenadines may enter Serbia visa-free for up to 30 days within a one-year period. Nationals of Hong Kong may enter Serbia visa-free for up to 14 days. Nationals of any country who hold a valid visa for, or are a permanent resident of, any European Union or Schengen Area member state or the United States may enter Serbia visa-free for up to 90 days within a 180-day period, provided the visa remains valid for the entire length of stay. All other nationalities who do not fall into the above categories require a Serbian visa. Check with the Serbian MFA for current info . Serbia announced that visitors with Kosovan visas or passport stamps issued by the authorities of the Republic of Kosovo will be allowed into the country. Currently, however, this is not the case, but entering Serbia from Kosovo without first having entered Kosovo from Serbia (i.e. without a Serbian entry stamp) is considered an illegal entry to Serbia and is not possible, except if using an ID card (for those nationals who can). Wizzair  (Basel, Dortmund, Eindhoven, Gothenburg-City, Larnaca, London-Luton, Malmö, Memmingen, Paris-Beauvais, Rome-Fiumicino, Stockholm-Skavsta). From the airport, you can easily reach the center of Belgrade with bus 72, which stops on the departures level. As at February 2015 the ticket prices are: RSD 89 (time-limited ticket, 90 minutes), RSD 280 (daily ticket), RSD 720 (3 day ticket), RSD 1.100 (5 day ticket), RSD 150 (if bought in the bus). There are also express mini buses (line A1) connecting airport with Slavija square. Ticket price is at February 2015 RSD 300 (€2,5). It takes approximately 30 minutes. Licensed taxi service fares from the airport and are prepaid with a voucher that must be purchased from the counter. The price varies depending on which Belgrade city zone you are traveling to. Prices range from RSD 1800 (€15) to RSD 8,200 (€72). Travel time to the city centre is approximately 20-30 min., depending on traffic. Incoming taxis have radio communication with airport authorities. This ensures passengers a better alternative. All licensed taxi drivers have a badge, an oval blue license plate with a serial number, and the Belgrade Coat of Arms displayed on the roof. Using unofficial taxis can mean high prices. Make sure that the taximeter is switched on unless you have haggled for a set price. Tariff 1 is the correct one Monday to Saturday from morning till 10PM. On Tarif 1, the meter should not move more than one dinar per click - moving three or four dinars per click is a sure sign that the driver is attempting to rip you off. Tarif 3 is the 'trick' fare used to scam out of obscene amounts of money, moving 50 or 60 dinars per click. Or better, take one of the several bus lines, check the Belgrade section. Wizzair  (Vienna; Basel, Malmö) summer only, starts from 25.june and 29. june 2015. Several international trains (day and night) connect Belgrade with Austria, Hungary, Slovenia, Croatia, Montenegro, Macedonia, Romania and Bulgaria. See Belgrade#By_train to detailed info and prices. Trains to Romania, Bulgaria and Macedonia tend to be often quite late (about an hour) and they are allegedly reported to often consist of old, not very comfortable, cars. Trains usually are very safe. Consider that many overnight trains cross country border in the middle of the night and custom officers won't have scruple to wake you up. There's no train connection from Greece. The former trains from Greece now depart from Skopje, Macedonia. A cheap way of traveling to or from Serbia might be the Balkan Flexipass. The Beograd-Bar line is one of the most scenic railways in Europe, with plenty of tunnels and bridges (including Mala Rijeka, the highest railway bridge in the world) and magnificient views of Dinar mountains. A trip on this line during daylight hours is definitely worth it. If your vehicle is registered and insured in an EU country you do not need a green card. Otherwise, make sure that your Green Card has an uncancelled "SRB" box. Coming in from Hungary, the Szeged/Horgoš border crossing is notorious for its congestion. If crossing the border from Hungary, try the Tompa/Kelebija crossing point, about 20km west, or the newly opened Backi vinogradi/Asotthalom crossing point. Similarly, when coming from Croatia, you may want to cross the border at Tovarnik/Šid instead of Bajakovo/Batrovci, and from Macedonia at Pelince/Prohor Pčinjski instead of Tabanovce/Preševo. Please note that cars overtaking on undivided highways will often use the unofficial "middle lane". Exercise caution and pull over to the hard shoulder on the right to let them through safely. Police are generally stationed at major junctions or at underpasses to control traffic and speed. Drivers commonly warn others of a police presence by flicking the high-beams on two or three times. Police interceptors patrol all major highways. Drivers speeding and/or driving aggressively are stopped. Speeds of up to 140 km/h in 120 km/h zones are usually, but not always, tolerated. Note that the traffic law is strict. No person under age of 14 must ride in the front seat, seat belts are obligatory for those who sit in the front, blood alcohol content is limited to 0.03% and fines are from €30 for smaller violations up to 60 days in prison and €5000 for causing a larger traffic accident (both locals and foreigners). Headlights must be always on. Important! If you are driving on country and local roads, pay attention to the bicycle riders, tractors and other heavy agricultural machines, especially at night! They can be without proper light signalization and hard to see, so slow down at night. Highway tolls cost on average 0.03€/km and can be paid in Serbian dinars, Euros or by Mastercard/Visa. They are charged by road section, so it's possible to pay more if only part of a section is used. Fuel (gasoline/petrol, diesel and liquefied petroleum gas) is plentiful and of EU quality, unlike 20 years ago. Prices are similar to those in neighbouring countries, i.e. slightly cheaper than Western Europe, but very expensive compared to North America. Vienna - Buses leave from Vienna International Busterminal (Erdberg) almost every day. For destinations south of Belgrade, Zoran Reisen coaches leave at 3PM on Friday, and charge around €45 for a one-way trip. Fudeks travels between Vienna, Budapest and Novi Sad and Belgrade. fare is 45 EUR round ticket. Hungary - When you take an international bus from Belgrade towards Germany, a collection is often held inside the bus for paying the Hungarian border guards a fee to let the bus go faster over the border. This is a bribe. On your way into Serbia, it seems cheaper, though the Hungarian border guards will demand all passengers sign a form declaring they offered no gift, cash or otherwise, to Hungarian border police whether they paid a bribe or not. Sofia (Bulgaria) - There are daily buses to Niš and Belgrade going from the central international bus station next to the central bus station, and adjacent to the central train station. The buses leave multiple times per day. There is a direct route once a day at 16:00 and all other buses (Matpu) offer a transfer in Niš. The buses from the transfer onward are operated by Nis-Ekspres. Be mindful as you will be asked to pay 50RSD in cash to stow your luggage in the bus that leaves from Niš. The trip costs 24 lev to Nis (information from 2013) and 52 lev to Belgrade, with an optional 2 lev student discount (accurate as of September 2016). Macedonia] - Fudeks has daily service between Belgrade and Skopje. The other alternative, Nis Ekspres may be a little bit cheaper, but slower since it has more stops and the bus is not so comfortable. There are some companies which offer trips to some destinations in Europe by passenger vans (mostly those with 8 or 14 seats), prices are a bit higher than the bus, but they are faster and have more flexible timetables, and they have a door-to-door service. Most of them have their schedules matched with departing flights from neighbouring airports abroad (i.e. Budapest and Timisoara). There are boat tours, which pass through Belgrade. These are Trafalgar Tours in English, which cruise along the Danube and have a two day stopover in Belgrade. Hitchhiking across Serbia is still acceptable and most drivers will treat you like a friend. However, necessary precautions should still be taken. Generally, it is easy to hitchhike through Vojvodina and much more difficult to hitch a ride from Belgrade to the south, to Kosovo, or Macedonia and Montenegro. The Hitchhiker's Guide to Serbia  offers a collection of hitchhiking tips for a number of cities and towns in Serbia. It was made by the members of the Serbia Travel Club, an association of independent travelers from Serbia, and is available in English and Serbian. The cycling route EuroVelo 6  which runs from the Atlantic Ocean to the Black Sea, crosses Serbia by following the Danube river. Most of the advised itinerary follows minor paved roads, and directions are clearly indicated by a specific EuroVelo 6 signage. Although too few cities offer appropriate cyclist-friendly infrastructures, cycling is slowly gaining interest among the population as an economic and sustainable alternative way of touring and commuting. The most common and convenient way of getting around Serbia is by bus. See Bus travel in the former Yugoslavia for more information. For information about Serbian bus traffic and detailed search of schedules see "Polazak.com Timetable". Trains within Serbia do exist but are slower than in western Europe, with the fastest ones reaching just 120 km/h. Few of the rail lines will be of interest to the tourist, since most rail lines serve small towns not served by bus, and usually with very old, slow trains. However, the government has begun investing again in rail transport on the main routes, which, although still slow, now offer modern and more comfortable Swiss and Russian trains. All of these routes offer new comfortable trains, with most old train having been replaced already. Construction already begun for a new high-speed railway line following the route Belgrade - Novi Sad - Subotica, scheduled to begin operations around 2020, this high-speed railway will continue on to Budapest. There is an English-language website for train schedules . Note that since 2017, national trains do not depart anymore from Belgrade Main Railway Station (Glavna Železnička Stanica), and they have been changed to Belgrade Centar Station, located far away form the centre; with Main Railway Station open now only for international train traffic. See the Get in by car section for information on driving in Serbia with your own vehicle. Renting a car is also possible; it might be convenient if you arrive by air and wish to visit non-urban areas not frequently served by buses. See Belgrade Airport Car Rental  for the latest prices. Indjija Rent-a-car  (tel: +381 (0) 62 84 19 199) (e-mail: [email protected]) has low fixed price rates (which you can consult in the webpage, in the section "Cenovnik"), and asks for no deposit. Reliable company, they deliver the car to your address or to the airport. The official Serbian language is similar to Croatian and Bosnian. Before the era of nationalist linguistic policies and the breakup of the former Yugoslavia, all of those dialects were all known as Serbo-Croatian. Today, people in the former Yugoslavia no longer use this general term for what remains as a common language. If you speak Russian, it can prove to be occasionally helpful for you, as the two languages have some similarities. This also includes all other Slavic languages, especially Bulgarian and Macedonian. English is commonly spoken throughout Serbia and the younger people tend to have excellent command. They are also quite willing to practice it with foreigners. Also, you can try with young people talking German, French, Russian, Spanish or Italian which are taught in Serbian schools. In Vojvodina, most people speak Serbian, but other languages are also used. In some towns near the Hungarian border, you are more likely to hear Hungarian. There are many smaller minorities, like the Slovaks, the Romanians, Romani people and the Russians, who often speak their native languages. Serbia's many sights include stunning castles, Medieval monasteries, lovely traditional villages and bustling cities with baroque parks and art-deco architecture. Its capital, Belgrade, is a lively European city with the Sava and Danube rivers running right through it. It's a nice place to spend time. Stroll through Prince Michael Street, the city's main pedestrian street, or have a drink on Skadarlija, a vintage street in the spirit of old Belgrade, filled with restaurants and cafés. There are a lot of old buildings on all four banks, including the huge Kalemegdan Fortress, that has been built, modelled and remodelled by Celts, Romans, Byzantins, Serbs, Austrians and Turks over more than 2,000 years. Once an important military fortification, it now serves as central park of Belgrade with beautiful views, especially during sunset. Within the fort is a zoo, a military museum, famous churches, galleries, parks, sports fields, etc. It has a multitude of various towers and ports, and two long walking/biking paths along both rivers. Other Belgrade sights include the modern Temple of Saint Sava, the National Museum and the Old Castle. The river island Ada Ciganlija has an artificial lake and an 8 km long gravel beach, which is visited by thousands of bathers during the summer. It's a lively place with lots of entertainment, cafes and restaurants, some of which are opened the whole year round. Zemun, now part of the Belgrade urban area, developed independently for most of its history and is a pleasant area with a distinct identity. Novi Sad is another delightful city, with the Petrovaradin Fortress (one of the greatest and best preserved XVIII century fortresses in Europe) as its main sight. The city also has a number of lovely parks that just ask for a long afternoon stroll or picnic. Sremski Karlovci near Novi Sad has a rich history, numerous monuments, museums, churches, galleries and famous wine cellars. Novi Pazar, your last stop before Kosovo, has a distinct Turkish heritage and a bunch of great monasteries in the surrounding area. Mokra Gora is a traditionally reconstructed village in the popular mountain region of Zlatibor. The village of Sirogojno is in the same region, with a nice open air museum and lots of traditional crafts on display. Very nearby is the traditional village of Drvengrad, also known as Mećavnik, which the Serbian film director Emir Kusturica built for his film Life Is a Miracle. If you've seen the villages, Zlatibor offers some great ski-resorts, hiking trails and landscapes. Or, hop on the The Šargan Eight, a narrow-gauge heritage railway running from Mokra Gora to Šargan Vitasi station (Zlatibor and Tara mountains). When it comes to the number of bridges and tunnels, Sargan Eight is unique in Europe and a ride on the 8-shaped track is a popular pasttime for tourists. Of the several national parks and natural areas in the country, Fruška Gora is undoubtedly one of the best. Dotted with ancient monasteries and wineries, it combines orchards and vineyards on its vast plains with tight forests on its plains. The Tara National Park covers some 20.000 hectares in the west of the country. There, the steep gorges of the Drina river and the high mountain peaks provide some stunning views that make a long hike well worth your effort, Hostel Tara Hikking Center is in the middle of the park and offers free guidance and maps for the trails at backpacker prices. The mountainous landscape of Kopaonik, in the south, offers some great ski and snowboard opportunities as well as great views and a rich flora. Largest and perhaps most breathtaking national park is Djerdap, located in the northeast of the country, bordering Romania. It consist of the steep gorge thru which river Danube runs and its almost untouched nature and wildlife rich banks. 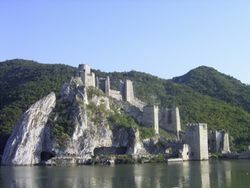 Djerdap is also filled with many archaeological sites, most famous of them is Lepenski Vir, considered to be a first human habitat on European soil. Vrnjačka Banja is the largest and most popular spa resort in Serbia and traditionally very attractive tourist resort for rest and recreation. It's the only mineral spa with a water temperature to match that of the human body, 36.5 degrees Celcius. Soko Banja is another famous spa and tourist place in Serbia for its moderate continental climate and immense surfaces of woods, fresh air and a lot of thermo-mineral sources. Palić is a lovely city in the north. Its baroque parks, monuments of art nouveau architecture and a long tradition in catering made it a fashionable summer resort and spa for the 19th and 20th century elite. Viminacium near the village of Stari Kostolac is an important archaeological site and was Serbia's first excavation project in the 1880's. It was once the provincial capital of the Roman province of Moesia (today's Serbia) and dates back to the 1st century. At the site you'll find archaeological remains of temples, streets, squares, a large amphitheatre, palaces, hippodromes and Roman baths. Another major archaeological site (and doubling as a spa) is that of Gamzigrad, which is one of the four UNESCO sites in Serbia. It hosts the remnants of an ancient Roman complex of palaces and temples called Felix Romuliana, and is considered one of the most prominent and best preserved late-Roman sites. Djerdap National Park hosts the archeological site of Lepenski Vir, home to one of the first recorded civilisations in European soil, with some objects dating from 13,000 years ago. Ada Ciganlija is also an excellent place to kick back and relax during summer. It is as locals call it the sea of Belgrade. A lot of sport fields and courts (soccer, basketball, golf, volleyball, etc.). Cafes serving ice cream and beer abound on the banks of this lake-beach park. Favorite leisure activity in Belgrade is drinking coffee in numerous bars, bistros and cafés (especially in Strahinjića Bana street, which is known locally as Silicon Valley). It is very strange, but most of places are occupied all day long - ie, within working hours. You should check: Downtown café, Buka bar, Movie bar, Iron café, Biblioteka café, Monza café-boat, Bibis café-boat, and many more; People who are not in the folk and MTV music, and don't like to drink overpriced coffee, should avoid this street. There are coffee bars on almost every corner in Belgrade, which offer more relaxed atmosphere and are designed with more taste that those in Strahinjića Bana street. Smederevo is a town about 50 km from Belgrade. There are direct bus lines almost every half an hour and it takes about one hour to get there from Belgrade. It is considered as the unofficial rock 'n' roll capitol of Serbia because of its many rock musicians and bands who live there or were born there. See the largest lowland medieval fortress in Europe (especially at night when its lights give a special romantic and mystical atmosphere) or go to a rock concert at "Moto Club Street Fighter" which is located at the very bank of the Danube. At the end of September, the town hosts a traditional festival called "Smederevska Jesen" (Smederevo Autumn) which is a festival of vine and Serbian culture with many concerts and other happenings. During the festival, there is a carnival located at the end of the town. Just stay in the town center. The Museum of Smederevo holds a lot of Roman and medieval items and collections, so for history lovers, it's a must-see. EXIT festival – Biggest music festival in SE Europe, that is happening in the beginning of July, in Novi Sad, on Petrovaradin fortress . Festival of traditional brass bands, "Trumpet Festival" in Guca village is held every year at the beginning of August.Festival of traditional brass bands, "Trumpet Festival" in Guca village located 20 km from the town of Cacak.During the festival in this small town a few days to go over half a million visitors.The festival in Guca is perhaps the biggest festival of this type, including a lot of visitors from abroad. Gitarijada - one of the oldest rock festivals in Europe which started back in 1968. It is held every year at end of July and beginning of August and takes place in the Kraljevica forest in the city of Zaječar . Belgrade Beer Fest, which takes place at Ušće every August . Foam Fest originated in 2009 and more than 60,000 people have visited it since then. LED screens arranged all over the Arena, with hundreds of light guns, lasers, robo heads and other light and sound equipment, numerous foamfalls and foam guns will classify this event again as a manifestation that sets new production standards in Serbia and the region Belgrade Foam Fest. Belgrade is very famous for its whole-night-party clubs. If you are looking for a place to feel the local atmosphere and good vibes, visit bohemian street “Skadarlija”. Please have a look at the Belgrade article for further options. Restaurants, clubs, cafe's and hotels are usually full-booked and organize New Years celebrations with food and live music. However, Serbian New Year's celebrations are most known for the outdoors festivities in Belgrade, and several other major cities such as Novi Sad, Niš and Jagodina. As of mid-December, cities are extensively decorated and lit. The decorations remain until way into January due to the persistent influence of the old Julian calendar. Throughout the region, especially amongst former Yugoslav republics, Belgrade is known as the place to be for major parties, concerts and happenings. It has become common for large groups of Slovenes to visit their former capital and celebrate the beginning of a new year. Especially since the mid-1990s, street celebrations grew into mass gatherings with hundreds of thousands of people, celebrating New Year on one of several locations throughout Belgrade. Also, on January 14, Serbians celebrate the so called Serbian New Year, which is actually New Year's Eve by Eastern Church calender. In the night between January 13 and 14, you can actually re-live New Year's Eve. The currency in Serbia is the dinar (RSD, динар, pl. dinari/динари). Coins are minted in values of 1, 2, 5, 10, and 20 dinars, and banknotes are printed in values of 10, 20, 50, 100, 200, 500, 1000, 2000, and 5000 dinars. The banknotes tend to be more common than the coins, so be prepared to carry around a large number of banknotes in varying conditions. Money can be exchanged at official exchange offices, locally called menjačnica, often carrying the emblem of the National Bank of Serbia outside the building. The rates here are usually better than those of the banks. It is much easier to convert Euros or other major currencies. There are many ATMs, which accept foreign bank and credit cards without a glitch. Visa, Visa Electron, Mastercard and Maestro are widely accepted. However, American Express and Diners Club cards are rarely accepted. Likewise, traveler's cheques are not a well known form of payment in Serbia and cashing them in could present a challenge. The dinar is not widely convertible outside Serbia; it is advisable to re-convert your remaining dinars to Euros or other major currencies before leaving the country. On the other way around, the easiest paper money to convert to Dinars is Euro, since other currencies from neighbouring countries (Romanian Lei, Hungarian Forint, Croatian Kunas, Macedonian Denars, Albanian Lek, Bulgarian Lav or BIH Marks are incredibly difficult to change). If you are traveling from any of the surrounding countries, make sure to change your left money to Euros, and back to Dinars in Serbia. Only few places in neighbouring countries, such as Republika Srpska and the border areas of Macedonia, will accept Dinars. Euros can be accepted as cash in a few locations, especially in gas stations or resting areas along the motorways and in non-government related agencies or shops (and except big chains) in any town outside the main cities (especially Belgrade and Novi Sad), due to the many people who live/work abroad. Old Yugoslavian currency can be purchased from street sellers. A RSD500,000,000,000 note makes an interesting souvenir. At Kalemegdan, near the fortress in Belgrade, you can pick up a set of 10 banknotes from the hyperinflation era for RSD500. Prices tend to be on par with the rest of the Balkans. However, import taxes make clothes and shoes in Serbia very expensive. Most ATMs (labelled as Bankomat) will accept most foreign debit cards for withdrawing money, the only exception being Komercijalna Banka. Although ATMs usually charge a very small fee for withdrawals, the exchange rate given by the bank is usually very poor, so it is still a safer bet bringing Euros with you in cash and changing then in an exchange office. Supermarkets are easily found in any area and within easy walking distance from any point in the bigger cities (Belgrade, Novi Sad, Niš. Kragujevac), and in every smaller town of at least 10,000 people. Even in areas of towns where there are no big supermarkets available, or in smaller towns and in every village, there is a convenience store at least, which will have at least the basic need goods available. The main supermarket chains available in the biggest towns and cities are Maxi and Idea, which keep the goods at relatively good price. Other chains not so widely extended are UniverExport, Aroma, Aman, Roda, Mercator or Vero, with Lidl arriving soon. Outside urban areas and with bigger quantity products, and cheaper price are big shops such as DIS, Metro, Velpro or Tempo. Some of the supermarkets are open 24/7, except on holidays. One noteworthy thing to remember when shopping for groceries in Serbia is that virtually all grocery stores require you to use a self-service scale when buying fresh fruits and produce, and the cashier will not be able to do this for you. If you don't weigh these products yourself before you proceed to pay, you will end up holding up the line for several minutes and possibly causing irritation in other customers. Ubiquitous in urban areas are small shops/minimarkets such as Shop&Go, Pikant and Višnjica Dučani, offering less goods and at a slightly higher price, and often working 24/7 as well. Organic food in supermarkets is growing as a trend in Serbia and most supermarkets will have a section for only organic products, and even some supermarkets, such as Idea Organic are beginning with the concept of selling only organic food (at a higher price as in other supermarkets). A safer bet though, can be the shops, also very commonly found especially in Belgrade, named as Zdrava Hrana / 3драва Храна, or "Healthy Food", which especialize in this kind of organic products. Note that GMO food is illegal for production and sale in Serbia. Note that groceries tend to be at a smaller price as in the rest of Europe if those are produced in Serbia or in neighbouring countries, and at the same price or maybe a bit higher as in Germany if it is a imported product from EU. In case of products imported from outside Europe (such as Soy Sauce), the price can be significantly higher than in most EU countries). For fresh products such as fruits, vegetables, meat and dairy, the best quality ones can be found in small markets (pijaca), found in any village, town and city, which are locally produced goods with a better quality and way less chemicals than those sold in supermarkets. Also, these products tend to be way cheaper than in the rest of Europe (with exception of imported tropical fruits). For smaller goods such as alcohol, tobacco, candies, beverages, snacks and even tissues and credit for your mobile phone, you can look for the omnipresent trafika or kiosk, small shops in the street, usually also working 24/7, where all these goods can be found, sometimes even more stuff. Except for small businesses and street shops and markets, almost every hotel, restaurant, bar, caffe, supermarket or shop will accept payment with credit/debit card, especially in urban areas. For smaller towns, it is advised to have cash on hand. Even for a country with such low salaries, tipping in restaurants or bars is totally not expected, although appreciated. Normally if you pay the amount listed on your ticket (Fiskalni račun) the dependent/waiter of the business will give you back the exact change, unless you explicitly tell them to keep the change. Note that saying Thanks or Hvala when giving the money for paying can be sometimes understood as "keep the change", so avoid saying this until your change is given back to you. If looking to buy traditional homemade products, such as Rakija or kajmak, chances are it is of a much better quality if bought home-made rather than in shops or supermarkets. One safe bet for those products are the markets or street stands. Otherwise, you can ask your friends or anyone in the street where to find a good one, especially for rakija, everyone will know someone who produces it at home and can sell it to you for a low price (600-700 RSD a liter). Imported and international brand goods such as clothing, shoes, technology and jewelry, among others, are usually more in Serbia than in EU countries, especially due to customs and consumer taxes, so it is better for these things, to buy them in a neighbouring EU country such as Hungary, Croatia, Romania or Bulgaria. Despite the high costs, for many of those goods is still possible to get a tax revenue at the time of exiting the country if bought in Serbia and upon presenting a proof of purchase (ticket). Most international brands in those fields and more are present especially in shopping malls such as Ušće (the biggest in Belgrade, located right next to the centre, across the river in New Belgrade), Delta City (New Belgrade), Mercator (New Belgrade), Rajićeva (the newest shopping mall, located right in the centre of the city), Zemun Plaza (Zemun), Stadion (Voždovac) or BIG Fashion (Karaburma), in Belgrade; in other cities there are some shopping centres with almost as many shops and goods on offer such as Sad Novi Bazaar and Mercator in Novi Sad, Forum and Mercator in Niš, and Kragujevac Plaza in Kragujevac. Cheaper goods can be found in outlets, the biggest and most frequented one being the Fashion Park outlet in Inđija, some 40 km outside of Belgrade. Serbian food is a typical Balkan mix of Central European and Near Eastern dishes. Serbs are very proud of their food, which is heavy on grilled meats and sausages, local cheeses and bread. Serbia is predominantly a meat-loving nation. In all major cities, there are many international restaurants, such as Italian and Chinese, Mexican, Thai, Lebanese, and Israeli. In Belgrade you can even find sushi or kosher food. There are international fast-food franchises such as McDonald's, KFC, and Pizza Hut. On the whole, prices are cheap compared to Western Europe with main dishes ranging from €5–20 per person. Most Serbian restaurants offer roštilj, a large plate of various unseasoned grilled meats, or any possible variety of grilled chicken wrapped in bacon and stuffed with cheese. It is possible to order fresh salads, plates of grilled vegetables, crepes, or omelettes if you are not carnivorous. Serbian cuisine is famous for its heavy use of varied vegetables, fresh or cooked. Bakeries – called pekara – are ubiquitous in the city center, and you will find a wide assortment of breads, sweet and savoury pastries, sandwiches, and pizza. Some are open 24 hours per day. A snack or light meal of pastry and drinkable yoghurt (similar to kefir but milder) will give you an added healthy boost when walking about the city center. Turkish delicacies such as baklava, tulumba, and other Greek/Turkish treats are also commonly found. Foods that vegetarians and meat eaters alike should try include kajmak (something between cream cheese and butter) and ajvar, a savory spread made out of roasted red peppers. It is also worth visiting a pijaca (green market) to buy some fresh fruit, vegetables and other grocery items. Pljeskavica (pronounced approximately: PYES-ka-vitsa) is the Serbian version of a hamburger which can be purchased from fast food restaurants. 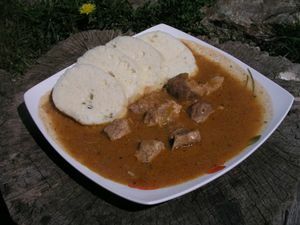 The most famous dish in Serbia is ćevapčići (pronounced: chay-VAH-pee, chay-VAP-chitchee). Also called Ćevapi, they are a traditional food eaten throughout the Balkans. It consists of different types of minced meat (pork and beef) mixed together, shaped like small sausages, and then put on the grill. It is usually eaten with diced onion, and is very tasty. Depending on size, a portion of ćevapčići in a somun (pita bread), possibly with onion, ajvar or kajmak, is between €1.5 and €4. Do not forget to taste the Karađorđeva Šnicla. It is meat that is filled with kajmak and bacon, and then also grilled. It is another traditional Serbian dish that honors the leader of the first Serbian uprising against the Ottomans. Burek (pronounced BOO-rek), sometimes decribed as the Balkan equivalent of McDonalds due to its being sold everywhere, is considered a national dish. It is made with a range of fillings including meat, cheese, spinach, apple or cherry. Due to the high fat content it is not for dieters. it is often eaten in the morning and can be sold out by the evening. Pečenje Ispod Sača (печење испод сача) -steam roast, lamb or pork but sometimes beef: in a clay pot with iron lid, all covered with red hot charcoal, roasted very slowly sometimes for a whole day. Kiflice (кифлице) (KEE-flitsay) small crescent-shaped bread rolls. Sarma (сарма) (SAR-mah) large rolls of pickled cabbage leaves stuffed with meat and rice. Čorbast Pasulj (Пасуљ/(PAS-ooy) - serbian thick bean soup or stew. A national specialty. Slow cooked, with onion and paprika. Pasulj Prebranac (пребранац) (pre-BRAH-nats) - Oven stewed beans with onions and various spices. Usually meat free. Riblja čorba (рибља чорба) (RIB-yah CHOR-ba) Fish soup using freshwater fish. Roštilj (Роштиљ) (ROSH-teel) - barbecued meats. 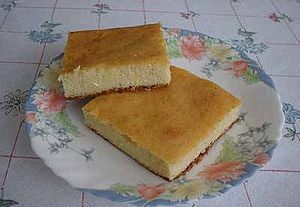 Proja (Проја) (PRO-yah) - a type of corn bread with white cheese. A national specialty. Ajvar (Ајвар/ iVar) - centuries before iPod, iPad and iPhone there was [i]iVar[/i]. Stove top roasted long red peppers, skinned, minced and stewed into a chutney like paste. Perfect as a breakfast toast spread, addition to any food or lightly fried with eggs. Kajmak (Кајмак) -clotted cream ranging from few hours fresh to well fermented. Almost exclusively home made for that extra flavour. Pure vegetarian restaurants are rare, but many places will provide you with non-meat food (just ask for 'posno'-colloquial term for non-animal and non-diary foods - but it could have seafood or seafood ingredients). Numerous fast-food stands (burgers, barbecue, pizza, hot dog, pancakes...) and bakeries (oriental and european paistry, pitas...) are usually very good and will satisfy your needs at a reasonable price. Pizza, sandwiches, and pancakes (crepes) are also commonly found. Salads are primarily tomato, cucumber, and onion, or cabbage. Local produce is fresh and organic. Coffee culture is particularly developed in Serbia. Walking about the central areas of the city you will find sprawling terraces and cafés, serving all types of coffee and sweets, particularly Viennese type cakes and local specialities. Be sure to try Serbian "Turkish" coffee and chestnut purée with whipped cream. Service charges are always included in restaurant bills. Rounding up the bill or adding a tip is customary when service and food were impeccable and ensures you get the best service next time you come around. Rakija/Ракија/ (excellent brandy that has many flavours, like plum /Шљивовица/ (pronounced like SHLYEE-va), quince /Дуњевача/(DOO-nyah), apricot/Кајсијевача/ (KAI-see-yah),like Pear /Крушковача/,like plum-juniper/Клековача/( something like Gin)... - You should know that some prestigious brands of rakija can be extremely expensive like Žuta Osa (ZHOO-tah O-sah), which means Yellow Wasp or Viljamovka (VEE-lyam-ovka) made of pear of the sort william , the most expensive and the most quality ones have a pear fruit in the bottle. Beer(Пиво). Jelen (Deer) and Lav (Lion) are the two most popular varieties of Serb beer, although Nikšićko from neighbouring Montenegro also seems very popular. Spring mineral water(Вода)-There are plenty of excellent bottled spring mineral water,from natural resources, protected areas. Tap water is perfectly safe to drink, and mainly of a good quality, too. If the water looks cloudy, it's because of air bubbles in the water. It's safe to drink, but you can also let it sit for a few seconds and watch the air bubbles clear up. There are also many springs and fountains with excellent-quality drinking water - the most popular ones being the fountain on Knez Mihailova in Belgrade, and the many fountains in the city of Nis. One must pay attention when it comes to water in Vojvodina. Some regions (like Kikinda and Zrenjanin) have heavily polluted water that is not even used for cooking, only as technical water. Universities in Serbia are of good quality, despite of not making it to the top places in the world or even European rankings. Although the main university is the University of Belgrade (Univerzitet u Beogradu), the University of Novi Sad (Univerzitet u Novom Sadu), because of the city's nature as a multicultural city, usually offers courses in other languages apart from Serbian, such as English, German, Slovak, Ruthenian (Ukrainian), Romanian and Hungarian, amongst others, and is usually the most popular choice for exchange students. Belgrade, Niš and Kragujevac universities also offer exchange or international studies programs, although mostly in Serbian language with fewer choices in English. The most common option for students with the desire of learning the Serbian language is the Faculty of Philology (Filološki Fakultet) of the University of Belgrade. Nevertheless, there are many other private institutions offering Serbian language courses for foreigners at a reasonable price. Courses of other languages (from English and Spanish, German, Russian, Italian or French, to even less studied ones such as Finnish, Hungarian, Greek, Catalan or Albanian) can be found in the faculty of Philology or in the smaller schools as well. Salaries normally are way lower than the EU standard, and Serbia keeps a quite high unemployment rate compared to other fellow European countries. Work is relatively hard to find for foreigners without skills in the Serbian language. That said, as a foreigner and especially with a language other than English, there are still some opportunities in the growing private sector (especially in fields such as IT), usually with competitive salaries, higher than the Serbian average and with a cost of life way lower than in other parts of Europe. However, there is a big chance that, no matter what your mother language is, there are a few Serbs who will speak it better than you and are privileged for some positions. And getting work permits and visas from the government can be sometimes very challenging, especially if you do not speak Serbian or know anyone who can make things easier for you (having contacts). Serbia is generally a very safe place to visit, with cities such as Belgrade being even safer than most big European cities (London, Milan, Paris, Barcelona, Rome). The locals are incredibly polite and helpful in case you require any assistance. (If you need any help finding/reaching a place, it's best to ask a younger person for help, as they are more likely to speak English.) However, you should always be aware of pickpockets, mainly in crowded tourist places and on public transportation. Street robberies, violent crime, murders, or attacks are highly unusual, even in dark or remote parts of the city. Organized crime is quite common, but doesn't target tourists or the general population. One should always watch out for drivers, who can be very rude to pedestrians or cyclists. There is still widespread intolerance against homosexuals. Racism is a minor concern, if you are from a different skin colour or features other than native Europeans, some people may give you some looks, but mostly these are out of curiosity (some people have never seen someone who is not Caucasian or East Asian), and generally have no bad intentions. In general, Serbs are less racist than people in most other countries, especially other Eastern European countries, but also than in most of Western Europe. Even if someone has bad prejudices towards someone with other skin colours, the possibility of a verbal or physical aggression is extremely low. The only real possibility of getting into trouble is with football hooligans in match days, especially during the Belgrade derby (Partizan vs. Crvena Zvezda), or in games between the national football team plays some "unfriendly" country, such as Croatia or Albania, in which the streets are heavily patrolled in case the hooligans want to make trouble outside of the stadium. Visiting a football stadium during those matches, or matches of the football team RAD Beograd (whose small base of ultras is known to be conformed of neo-nazis) is highly unadvised, unless you know what you are doing. During those days as well, avoid using colours that can identify you for someone from those teams (red and white or black and white). The possibility of confrontation with hooligans outside of such dates is highly unlikely. Following the Yugoslav wars of the 1990s, reports of UXO's (unexploded ordinances) have occurred outside the major cities. Keep an eye out for markings which may note a potential UXO zone when outside the cities and always stick to well-trod paths. If you find a suspicious object resembling a bomb/mortar/landmine, DON'T touch it. Report it to the nearest police station immediately. Although most or UXO's have been cleared, it is also very unlikely that you will find any of those, even in the least visited parcels of Serbia. Serbia stands on a major heroin trafficking route between Middle East and Europe. Serbian police is one of the key factors in revealing and cutting drugs smuggling canals. Because of that police is highly intolerant to anyone trying to buy and sell illegal substances and especially to those persons trying to smuggle illegal substances into the country. Foreign citizens caught in possession of illegal narcotics are likely to be charged for drugs smuggling, turned over to Interpol and banned from re-entry for a lifetime. In case of any medical emergencies you should dial 194 and call the Emergency Ambulance service. All foreigners have the right to receive help. The ones coming from the country Serbia has signed a special health insurance treaty can have it for free, others have to pay on the spot. Many people come to Serbia to primarily have a medical procedure done and visit the country along the way. They become a part of the medical tourism. It is well developed business. There are even medical tourism agencies that offer complete services from transfers, booking accommodation to organizing city tours. Serbs are a very friendly, polite and hospitable people, especially in the southern parts of the country. When you are invited into a Serbian home, make sure to bring them a gift if you are coming for the first time. Anything is fine from flowers to chocolate or alcoholic drinks and indeed something representative from your country. If you are bringing flowers, make sure you bring an odd number of them, as an even number is usually brought to funerals. When inside the house, don't ask for anything for they will surely offer it. If you are thirsty it is polite to ask for a glass of water. The host probably forgot to offer you a drink and will do so. In public transportation it is considered polite to offer an elderly person or a pregnant woman a place to sit. Make sure to wait for everyone to exit the vehicle before you enter, as to avoid dirty looks. Since many Serbs feel nationally frustrated by the recent historical events in the Balkans, it is best to avoid discussion of the 1990s Yugoslavian Wars, the NATO bombing of Serbia. If someone brings the topic up, try to avoid giving any strong opinions until you can assess your acquaintance's views. Do not mention support for Kosovo independence. The US's vocal support of Kosovar independence, in addition to the 1999 air strikes caused some ill-will directed towards the West, particularly towards the US (though unlikely on a personal level). However if you share the views of most Serbs some may be willing to discuss the subject and many will be happy speaking to a Westerner who shares their views. On the other hand, talking about Socialist Yugoslavia and Tito will not raise as many eyebrows; as most will not hesitate in talking about it and some may even approach it with a strong degree of affection towards that more stable and peaceful era. But it is possible to approach strong anti-communist and nationalist attitude, especially among young people and some rural areas, where old communist/nationalist divide from WWII is considered still alive. Remember, Serbia does not recognize the independence of Kosovo but maintains relations with Slovenia, Croatia, Bosnia, Montenegro, and Macedonia. Serbia is a predominantly Christian Orthodox country, though secular, it is extremely rude to insult or mock some of its traditions, and ensure that you do not speak badly of the Christian religion. Similar to other ex-Yugoslavia countries, Serbs do not like their country to be described as part of "Eastern Europe". Another common misconception is that Serbia was part of the Soviet Bloc (in fact, it was part of Yugoslavia that notoriously split with the Eastern bloc back in 1948). While in other nations of Eastern Europe Russia remains unpopular due to its influence over those nations during the Cold War, in Serbia Russians were always seen as friendly brotherly people. People have no problems talking about the communist period or Tito and often become even nostalgic over it. When toasting in Serbia, as in the most of European countries, make sure you make eye contact. You may be invited to drink gallons but are expected to be able to hold your drink. Being obviously drunk is a sign of bad taste, lack of character, and worse. Be careful, "rakija", a plum spirit (usually about 53% alcohol content), is stronger than expected, and will make you drunk fast! It is always nice to toast in your companion's native tongue. Cheers is živeli in Serbian, egészségedre in Hungarian. Don't point with your finger at someone. This is considered rude. The word molim (please) is key to polite conversation in Serbian. It basically means please, but also you're welcome, an appropriate response when somebody thanks you (and says hvala). It also means I beg your pardon?. Just saying Šta? (What?) can sound rude. It may be said that the use of the word molim is similar to the use of bitte in German. Like most European languages, has the formal and informal way of saying you (Vi and ti). Use the formal Vi version when addressing older people. People are normally not addressed or referred to by their first names, unless among friends or relatives. Parts of Russia#Respect also apply here (in particular Home Etiquette and Dining Etiquette). Dobrodošao! (Serbian Cyrillic:Добродошао!) = Welcome! Kako se zoveš? (Serbian Cyrillic:Како се зовеш? )=What's your name? Zdravo (Serbian Cyrillic: Здраво)= Hi, the most common informal greeting, used both when coming and leaving. Vidimo se, kasnije! (Serbian Cyrillic:Видимо се, касније! )=See you, later! Ćao (Serbian Cyrillic: Ћао)= Similar to "Zdravo", even more informal (pronounced the same as in Italian, but with different accent). Used more commonly when leaving. Kako si? : Dobro, a ti!? (Serbian Cyrillic:Како си? : Добро, а ти! )= How are you ? : Good, and you!? Izvinite! (Serbian Cyrillic:Извините! )= Excuse me! Srećan put! (Serbian Cyrillic:Срећан пут! )=Have a nice trip! Volim te! (Serbian Cyrillic:Волим те! )=I love you! Sviđaš mi se! (Serbian Cyrillic:Свиђаш ми се! )= I like you! There are three GSM/UMTS mobile phone networks in Serbia: MTS, Telenor and Vip. Prepaid SIM cards usually cost 200 dinars and there is no need for identification when buying them. In some stores you can buy a simple mobile phone packaged with prepaid SIM card for 2000-3000 dinars. To call a mobile phone the full number must be dialed. 0+mobile prefix+ number (06XXXXXXXX) The zero is omitted when calling from another country. Pošta Serbije (English site: ) is the national mail service, and it is fast and reliable. Apart from usual mail services, it is also possible to pay in the mail offices for other services (such as home bills), as well as to make and receive money transfers for a small fee (usually Western Union works with Pošta Srbije), as well as money exchange and insurances. Almost every post office will have a small souvenir shop and an ATM as well. Post offices are ubiquitous in bigger cities and towns, and almost every village has one as well. Working time is from 8:00 until 16:00 (only working days) in the smaller ones and from 8:00 until 19:00 (working days) and 8:00 until 13:30 (Saturdays) in bigger offices. They are closed on Sunday. The main post office, situated in Takovska 2, Belgrade (phone: 011-321-0070), is open 24 hours. In almost every post office, especially in bigger towns, most of the staff speak at least a bit of English. Internet cafes are almost inexistent now, when everyone has a computer and net access at home. WiFi hotspots are to be found almost everywhere in the larger cities, especially in the centre of these cities. almost every cafe, pub or restaurant has WiFi access, and will be glad to let you use it. Internet is usually of very high speed even for European standards, and it is inexpensive as well. Buying a SIM Card with prepaid Mobile Data access is a very good option if you plan to stay for a few days in the city. MTS offers 1GB of internet access -42 Mb/s download-, valid for 7 days at 200RSD (less than 2 Euros). This page was last edited on 9 March 2019, at 20:57.